I realized that I should just start buttoning everything in sight since I own all those buttons now. So I made this little button tree last weekend and it was lickety split. All the buttons are held in place with glue dots and since I have been buttonizing everything I have officially run outta glue dots. 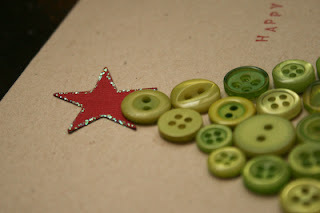 The little star on top is cut with my old Sizzix and then sticklized on the edges, I also stickled my fingers in the process. Cut the litte trunk myself. The greeting is from Savvy Stamps and stamped in Real Red. 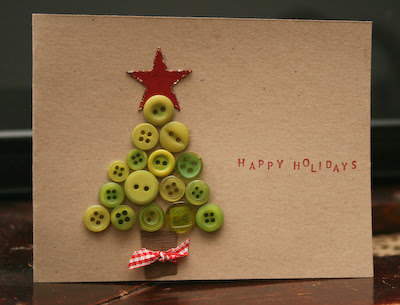 I made another little button card but I sealed it in an envelope before I remembered I hadn't taken a picture. Because of the buttons, these little button cards were sent along with presents to some girlies down south. i love the button trees! very cute! Simone, this is SO cute!! I hardly ever use buttons, but I could so see myself doing this (but, I'd have to spend more $ and I'm tired of 'doing Christmas' now. Thanks for reassuring me the eye twitch is prob. just stress. No twitching today so far! Gah! This is freakin' adorable. I must have missed these before - I love em! How adorable! I may try it with hearts for Valentine's!! TFS! !